I have a USB3 or GigE camera connected to my computer. When I open NI Measurement and Automation Explorer, I either do not see my camera or, if I do see my camera, I am unable to obtain images because I receive error "Camera not found." When I look at Windows Device Manager to make sure that the camera is recognized correctly, the camera shows up as an Unknown Device. Open Device Manager from the Control Panel in Windows. 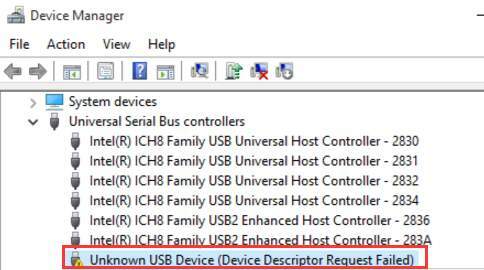 Right-click on the Unknown Device and select Update Driver. Select Let me pick from a list of available drivers on my computer. With Show compatible hardware checked, choose the NI-IMAQdx Vision Device version that matches the version of IMAQdx that you have installed and click Next to install the driver. After install completes, you should see "Windows has sucessfully updated your driver" and your camera should now show up under NI Vision Acquisition Devices. The specific name of the driver will depend on the type of camera you are using. If you are using a USB camera, you should see NI-IMAQdx USB3 Vision Device. If you are using a GigE camera, you will see NI-IMAQdx GigE Vision Universal Driver or NI-IMAQdx GigE Vision High Performance Driver. If no NI-IMAQdx Vision driver shows up in the list, continue with step 6. If steps 1-5 do not lead to a successful install of a driver, we can point the utility to directly to the inf file for the camera. Navigate to C:\Program Files (x86)\National Instruments\NI-IMAQdx\Staging\ and then select the folder associated with the appropriate camera type (Ex: NI USB Vision or NI GigE Vision). Choose the .inf file within this folder and select Open. In the Install From Disk window, click OK. You should now see NI-IMAQdx Vision Device in the list of models. Click Next to install the driver for your camera. The camera should now show up in Device Manager under the NI Vision Acquisition Devices category as NI-IMAQdx Vision Device.